There’s a new sheriff or two in Nashville. Along with Tennessee Titans’ second-year head coach Ken Whisenhunt, former Oregon Ducks quarterback Marcus Mariota has joined a freshly assembled Titans’ posse, and is already regarded as THE guy in Tennessee. The NFL franchise that once boasted the careers of Earl Campbell, Warren Moon and Steve McNair, capitalized big time by swooping up the Heisman Trophy-winner at No. 2 in the first round of the 2015 NFL Draft. And while the big island’s top banana makes his umpteenth appearance on the latest cover of Sports Illustrated, FishDuck.com is looking at three reasons that Oregon’s record-breaking quarterback is the Music City miracle Titan fans are hoping for. Nothing is more imperative to the success of a rookie NFL quarterback than the coaches that initially surround him. Too often young talent is placed in the wrong, unknowing, or simply incapable hands, turning shiny hopefuls into head-slapping calamities and setting back a multimillion-dollar organization several years. The list of failed NFL quarterbacks is painful and very real. However, Mariota’s coaching situation in Tennessee could be a match made in football heaven. The 2015-16 NFL season marks Whisenhunt’s 18th year as a professional football coach. And when it comes to winning, this isn’t the offensive guru’s first rodeo. Whisenhunt has coached some of the greatest arms in the business as they rose to the top of “The League,” – Ben Roethlisberger (offensive coordinator, Pittsburgh Steelers: Super Bowl XL champions), Phillip Rivers (offensive coordinator, San Diego Chargers: 2013 Pro Bowl selection) and the resurrection of Kurt Warner (head coach, Arizona Cardinals: Super Bowl XLIII appearance; 2008 Pro Bowl selection). The bottom line: Whisenhunt knows quarterbacks, but more importantly, he knows how to create and sustain a winning culture. For Titans’ fans, the pairing of Mariota with Whisenhunt is a captivating match-up. 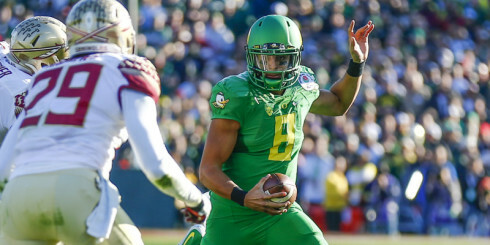 With Mariota, there are no bad habits to remedy nor a galactic-sized ego to temper. What the Titan’s have is a humble, hard-working and athletically gifted young man who is committed to becoming the best at his position. That’s enough to make any southern football fan’s teeth sweat. Whisenhunt: We’ve already started working on that. We’ll have a plan. I think one of the important things is … you’ve got to push him, you’ve got to challenge him. But, obviously, there are some things he does well and we’ll incorporate those into what we are doing. So it’s going to be a little bit of a blend. Mariota: I’m going to do my best to transition everything. I’m going to continue to be the player that I’ve always been and do whatever is asked of me. Coach Whisenhunt is going to have his offense and his complexities of his system, and I’m going to do my best to execute it. I won’t change the type of player I am and hopefully we’ll continue to find success and execute well. At 6’4″, 212 lbs., Mariota offers the real potential for an Andrew Luck-type success story in Tennessee. Why? Not only is he tall, strong, and talented, but the young quarterback is surrounded by a coaching staff willing to tailor an offense around his picadillos. After last season’s rough 2-14 performance, the Titans’ have reloaded their offense with potent rookie buckshot. Whisenhunt and Co. selected fullback Jalston Fowler, running back David Cobb, and wide receiver Dorial Green-Beckham to surround Mariota with a fresh set of weapons. For Whisenhunt, the approach to handling someone of Mariota’s caliber is to reduce whatever learning curve exists and bend the playbook in his favor. It appears the mentality has changed in Nashville. Instead of handwringing and finger pointing, the Tennessee brass have gone on the offensive, quite literally, and set out to rewire their system. The Titans simply had the wrong players to carry out the job. And you can bet you won’t see the Titans’ precious new commodity scrambling around like Robert Griffin III on some blown-up screen play and taking a beating in the open field. 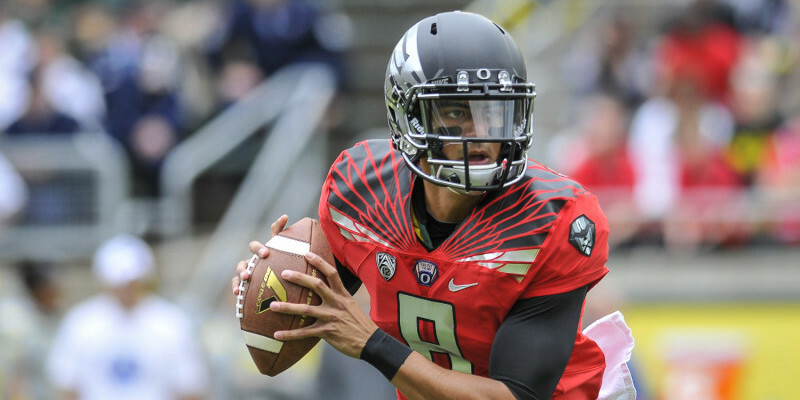 Oregon Ducks Heisman Trophy winner Marcus Mariota brings his talent and skills to the Tennessee Titans. Every NFL organization is looking for a sterling representative of their club, the face of a franchise of which fans can be proud to get behind and watch on Sundays. And after the failed Jake Locker experiment in Tennessee, Mariota is just what the doctor ordered. Locker, while talented and capable, doesn’t possess the “X” factor aura that made legends such as Campbell and Moon shine so brightly. In Eugene, the Oregon Ducks football team held their annual spring game following several weeks of practices. Mariota was in attendance and received a standing “O” and collective “thank you” from the university and fans. The Ducks’ No. 8 gave fans something truly special, and along the way, redefined class, sportsmanship and elite athleticism among college athletes around the country. That kind of player doesn’t often just “lose the juice.” A strong, supportive family grounds Mariota, helping him become the best possible version of himself while navigating the oft troublesome waters of college and professional athletics. Forget the idea that nice guys finish last. Oregon’s offensive coordinator and Nebraska’s two-time national champion quarterback Scott Frost has consistently dismissed that notion. I survived in the league for six or seven years and was around some really good quarterbacks. Marcus has what it takes to become one of the six or seven elite quarterbacks in the NFL. Barring injury, three or four years from now, I think he is one of those guys you’re talking about like Drew Brees and Tom Brady and Peyton Manning; I really do. He has everything that a quarterback needs to be successful. And the fans are responding in droves. Everything from jerseys to ticket sales have surged, an uptick that is the direct result of No. 8’s arrival in Nashville. Everyone is sold on Mariota, from the fanbase to the front office, and they don’t have plans of letting go of him anytime soon. Titans’ fans deserve Mariota. Duck fans can rest easier knowing their quarterback is in experienced hands. While at times, there will be learning moments, the 2015-16 NFL season will be a success for those who know, love, and follow Mariota.